Great Coral Bay Location. Mint condition property. Enjoy the view, this West Indian style stone cottage offers. Beautiful Coral Bay is a few steps away from your deck and door! Stoneharbor Cottage is located within walking distance of the charming Coral Bay community. Restaurants, shops and even a small grocery store are a short stroll of your vacation destination. Fantastic sunrises await you every morning while taking an early morning dip in your own delightful pool. It is a perfect getaway for one or two couples or a small family. The great room offers a completely furnished kitchen, living room and full bath. In addition, there is a charming loft furnished with queen bed for the kids or the second couple. The air-conditioned master bedroom is furnished with a king-size bed and offers a private bath. Laundry facilities are available on site. This is beautiful home, very true to the pictures and then some! Mr. Miller was very responsive and made sure to check in with us periodically. The community of Coral Bay just down the hill (easily walkable) was friendly and convenient. We absolutely loved it here and on St. John in general, and are hoping to return one day! I hesitate to give a good review because this little gem has already been discovered by too many others. We were only able to rent for 5 of our 12 night vacation. We have been coming here since 2003 and now cannot rent soon enough. We love Stone Harbor cottage for its location, amenities, and price. This house was perfect for our first visit to the islands and will be for any future visit. The house was comfortable and had everything we needed. The pool was a perfect way to end a day at the beach or scuba diving local wrecks. We spent every evening on the porch, overlooking the view and planning out our next day. We were trying to pick out our next visit before we had even left! Stone Harbor is a simple and perfect house - everything you need in the best location in the heart of Coral Bay. My husband and I have stayed here many times, and each time it just gets harder and harder to leave. After a day of hiking and snorkeling, the pool is so refreshing. We love hanging out on the deck to watch sugar birds, hummingbirds, baby goats and all the beautiful boats in the harbor. We love walking to Skinny's, Indigo Grill, Pickles and Aqua Bistro. Crabby's is right there too if/when we need to rent any snorkel gear or kayaks. The kitchen is well stocked, there are plenty of towels, and when our blender broke (tragedy!) Marc Miller swung by with a new one. Crisis averted. We love Stone Harbor! Just back from a stay at Stone Harbor Cottage to celebrate my wife's birthday. We picked a fantastic location. Wonderful private feel but just a short stroll to the heart of Coral Bay. Amazing sunrise each morning as we drank coffee and decided which beach to relax on for the day. We have always stayed in the "big city", Cruz Bay. After many day trips to this side of the island we took the plunge. It is not our last and we are already looking at the calendar for next year, back to Coral Bay, and back to Stone Harbor. 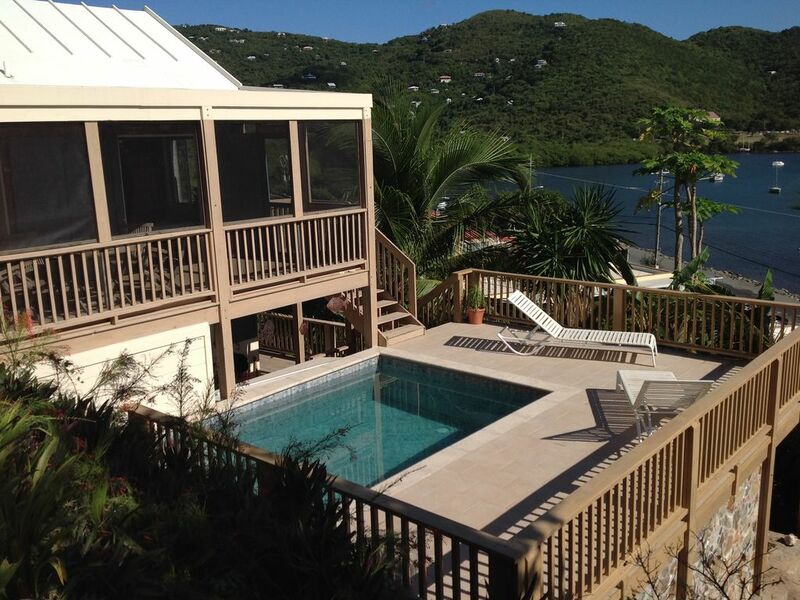 Stoneharbor was the perfect place to stay while visiting St. John. With so many different beaches to explore on this Island, location is key and this house in Coral Bay provides every thing we needed and more. We had a couple of nice restaurants and a well stocked grocery store only a very short walk away, making it very convenient to shop or grab a bite while at the house. Being located in Coral Bay we had some of the most beautiful beaches in the world to the east, west and north of our location, all within a few miles of Stoneharbor, a short 10 to 20 minute drive to beautiful white sands and warm, clear blue waters perfect for swimming, snorkeling and paddle boarding...or just soaking up the sun! This house is well taken care of, It was clean and comfortable, everything from the beds and linens to the dishes and kitchen utensils, everything was in good working order. Most of our days were spent out and about exploring this beautiful Island, but our evenings usually consisted of some pool time both before and after dinner whether we barbequed at home or went out for dinner. The large screened porch and swimming pool are great assets for this property which we used everyday. I would definitely recommend Stoneharbor.